Anna Niedermeyer has a BFA in Sculpture from Pratt Institute. She began her professional career at Schwartz and Sons branding agency, where she was exposed to the world of creative brand identity and content development. She began freelance prop styling in July 2012, as well as fabricating props, sets and costumes for clients. 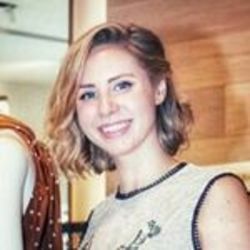 Anna’s clients list includes, but is not limited to, publications and brands such as Vogue, Vogue Italia, D-section, VS Magazine, Haute Living, Haute Times, Avon, Macy's, Bloomingdales, Schumacher, Carters, Martha Stewart, Target, David Stark, Real Simple Magazine, Red Book, Parent Magazine, and Food Network Magazine . She is currently an independent designer and stylist working in the fields of commercial interior design, set design, and accessory design as well as creative brand development and art direction. She Launched the Handbag line OPIA in Spring 2017 with a wholesale partnership with Saks Fifth Ave. She is the creative director, designer and co-owner of the business. Anna is extremely interested in developing and collaborating with clients on evocative spaces, objects, and images. She currently lives and works in New York City, but is very open and available for travel.